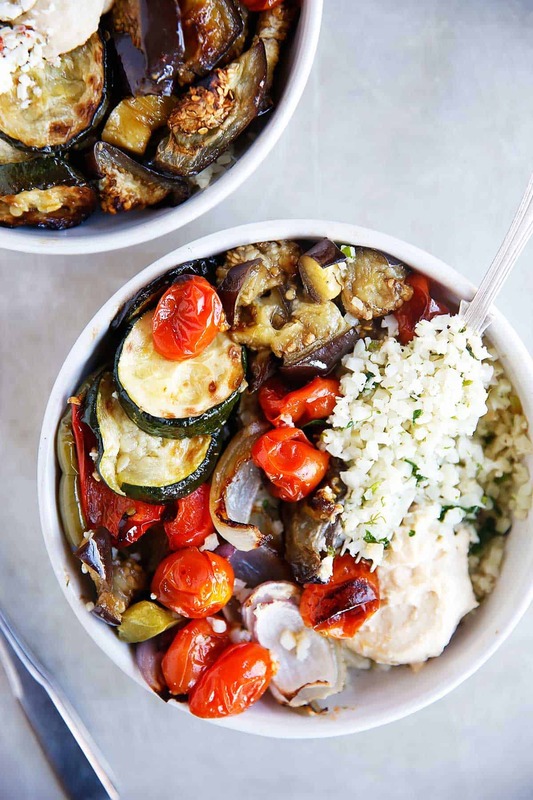 These Greek Veggie Bowls with Greek Cauliflower Rice are a weeknight favorite of ours! Packed with veggies, fresh herbs, hummus, and so much flavor, these easy-to-prepare gluten-free bowls are a fabulous dinner or lunch, and perfect for meal prep! I am loving all things Mediterranean, Greek, and Middle Eastern lately. If you tried my Mediterranean Fritters or Bowls, you know just where I’m coming from. The flavors are just so delightful, healthy, and fresh! These Greek Veggie Bowls are simple and perfect for meal prepping or a quick meal any night of the week! 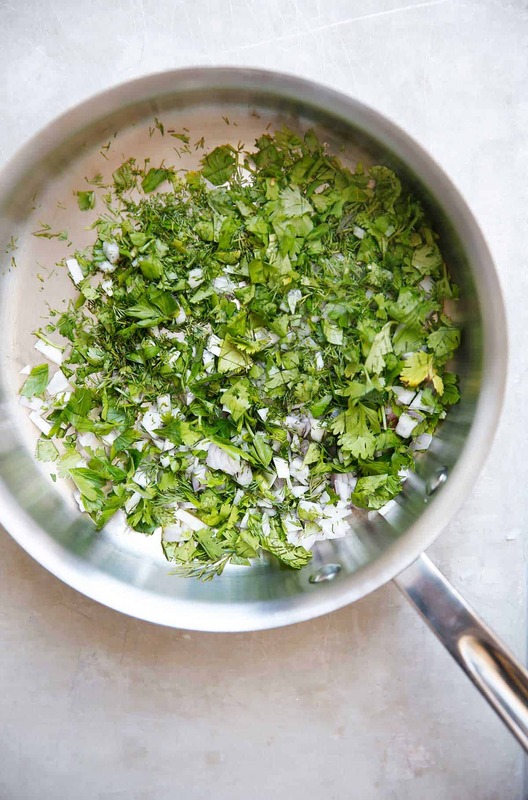 All those fresh herbs going into that cauli rice! 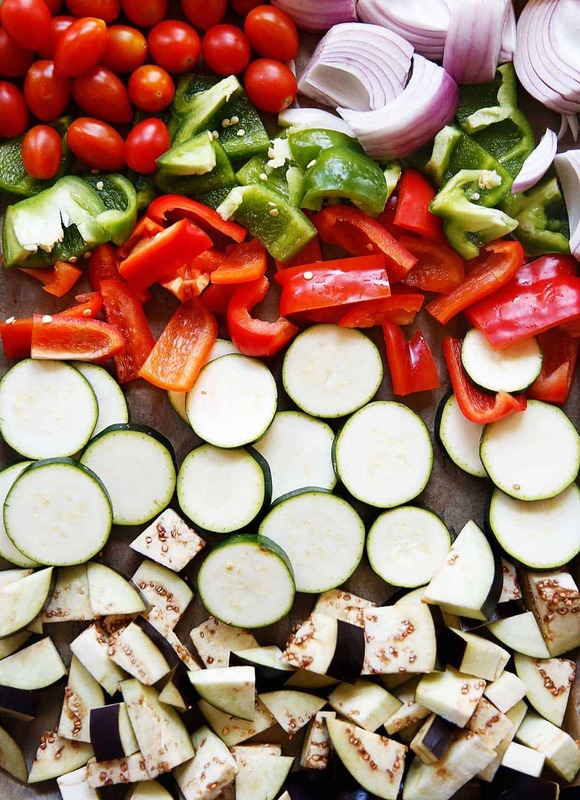 Line a baking sheet with parchment paper and spread veggies across it in one single layer. Toss with extra-virgin olive oil, sea salt, and black pepper. Bake for 45-5o minutes, or until veggies are soft and start to blister. Heat oil in a medium saucepan over medium-high heat. Add in onion, garlic, and herbs and cook until the onion turns translucent. Add in cauliflower rice and lemon and cook for 5 minutes. Take off heat and set aside. Assemble the bowl! 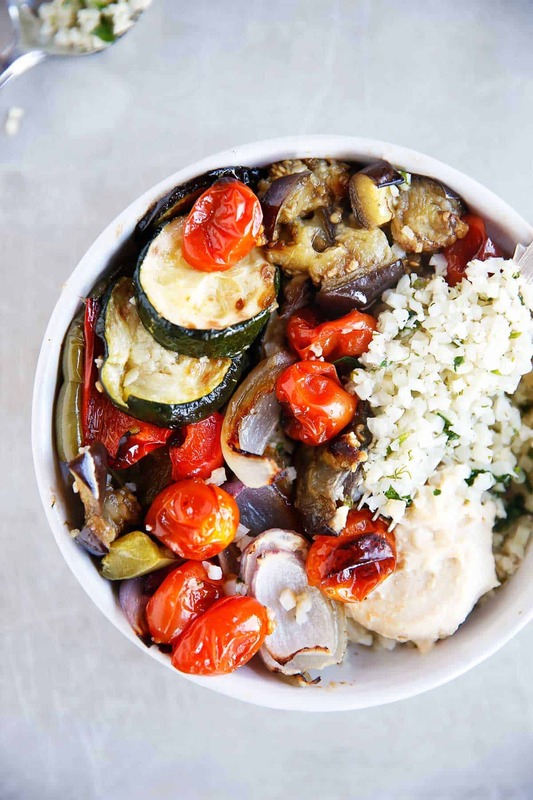 Place roasted veggies and cauliflower rice in serving bowls of choice. Top with hummus, feta cheese (if using), and serve right away or store in an airtight container for later. *To make this dish with regular rice, follow the directions on your basmati rice package, and add fresh herbs, garlic, and onion to the water while cooking your rice! I would so look forward to this dinner all day! Oh this looks so good!! 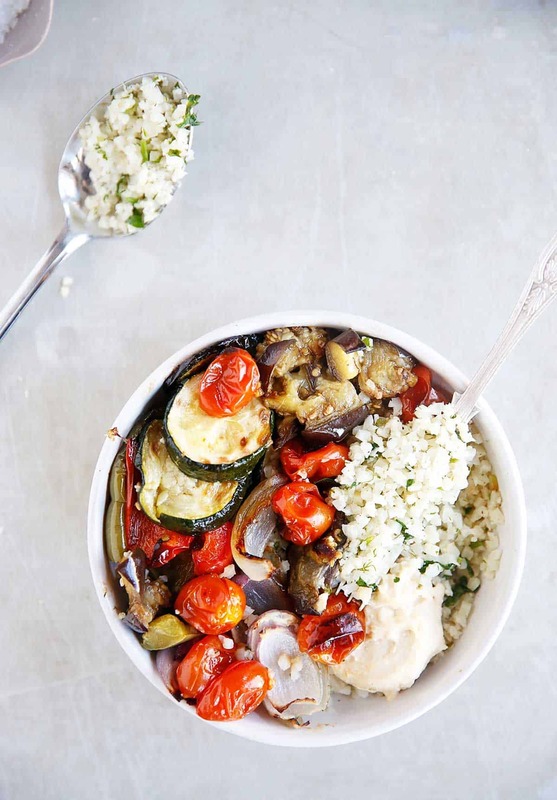 Roasted veggies, cauliflower rice, and hummus – you can’t go wrong! ooh, yum, I want this for dinner! 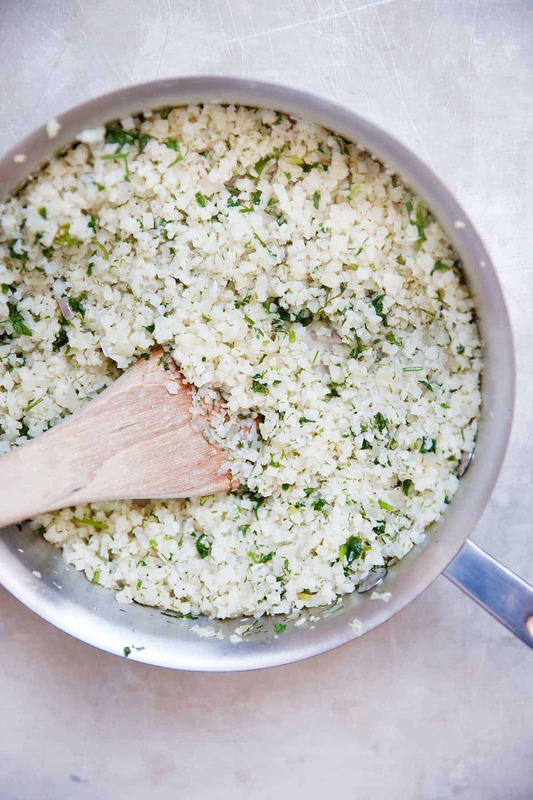 Such a creative way to use cauliflower rice! Ohhh wow!! These are right up my alley! Came across your website for the first time. Worth it!. Nice selection of ingredients. Just I guess I will have to say no to feta cheese! This looks SO delicious! I think I could eat this every. single. day. Thanks for sharing! This has become my weekday lunch for 2 weeks in a row now!! I make it at the beginning of the week and eat it for lunch the whole week!! It’s so delicious and I absolutely look forward to lunch everyday!! Thank you so much for this delicious healthy recipe!! I love your recipes!! This one is definitely a favorite!! Love it. So glad you like it!!! I made this at the beginning of the week for a light dinner with garbanzo beans, but I’ve been enjoying the roasted veggies for my lunches all week. Easy, light and tasty!